Evernote has become a staple in my everyday personal and professional life both as an archive for documents to maintaining dynamic lists. I have archived documents such as manuals for my electronic equipment, recipes, work documents, meeting notes, notes about health and travel and notes about practices and games for the U8 Girls Soccer Team I coach. Additionally, I’ve found Evernote to be very useful in maintaining dynamic lists including lists for shopping, wines I enjoy and wish lists of items around the house I would like to upgrade. 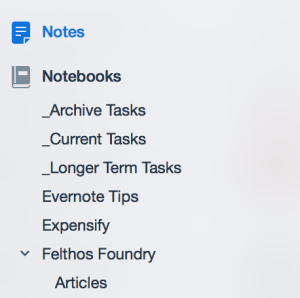 Even more dynamic, Evernote has become my system of record for my task list using a series of Notebooks and processes. I’ve used Todoodle, Todoist, Google Tasks, Outlook’s notes, paper and more but have not kept a task list process as long as I’ve used this system so I wanted to share with the Geek’s readers. Leveraging Notebooks and the Checkbox feature combined with a simple process and template note, I have a simple recurring task or to do list in Evernote synced across my phones, iPad and computers. 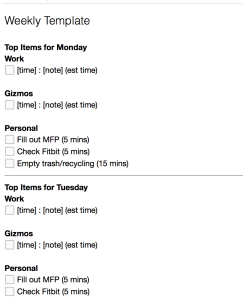 Next I created a standard template note for an entire week starting with “Top Items for Monday”, then I split by categories such as Work and Personal then I have a standardized format for the individual tasks. Breaking this down further, I start with “Top Items for Monday” followed by “Top Items for Tuesday” through Friday then I combine Saturday and Sunday into “Top Items for the Weekend” as my weekends tend to be less structured than Monday through Friday. Under each “Top Items” header I include my Work, Gizmos for Geeks and finally Personal headers and repeat that under each “Top Items” header. Finally, I use the Checkbox feature in Evernote to add my individual tasks. Each task has a specific purpose and clear step to perform. For example, instead of having a task that says “Do Taxes” I’ll have several individual tasks such as “Gather Work A W2”, “Gather Bank A Income Statement” and “Purchase Tax Software from www.taxsoftware.com”. Splitting larger tasks into consumable bites and providing details (phone number to call, etc…) to get the task done is critical. As you can see by the screenshot, I have a daily personal task where I “Fill out MFP” and it takes on average 5 minutes to perform. MFP stands for MyFitnessPal which is a cloud service that tracks what you eat. I also try to keep track of estimated times so I do not overcommit tasks each day. In my experience, if my estimated time is more than 6 hours I will not accomplish everything on my task list due to pop-up tasks, general daydreams and life. Finally, I do nightly and weekly processing to keep my list up to date. Monday night through Friday night, I make sure all the tasks for that day have been completed. If not, I will move uncompleted tasks to the next day and re-arrange my task list. Remember, if I schedule more than 6 hours in a day I tend not to complete the list so I may need to re-arrange the rest of the week’s task list. Additionally, I will review the next day’s tasks and update the task list with any meetings or tasks that have come up and must be completed. The screenshot in this article is of my “Weekly Template” note. 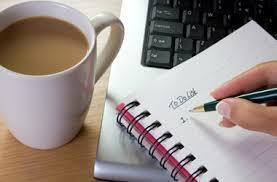 Next, I make sure all tasks were completed for the previous week and if not add to the newly created note. Finally, I add any new tasks that I need to accomplish during the week. One last thing to note, I do not record every task item that I have. If a task item pops up and I can work on and complete it right away, I will not include that for example. I do not include standard task items such as “Brush teeth” either. The goal is to have an efficient and easy to consume task list that, when I have time, I can tackle an item quickly and efficiently. 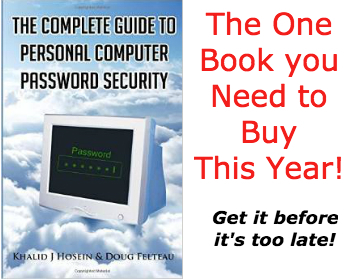 This process combined with Evernote has been working in it’s current incarnation for the past four months. I do need to point out that some of the concepts are borrowed from Getting Things Done and Jenny Blake. Hopefully this strategy will help you wrangle your tasks lists in. If you use a different strategy with Evernote, please leave a comment or send a tweet to @dfelteau as I’m always looking for tweaks to have a better recurring task list.